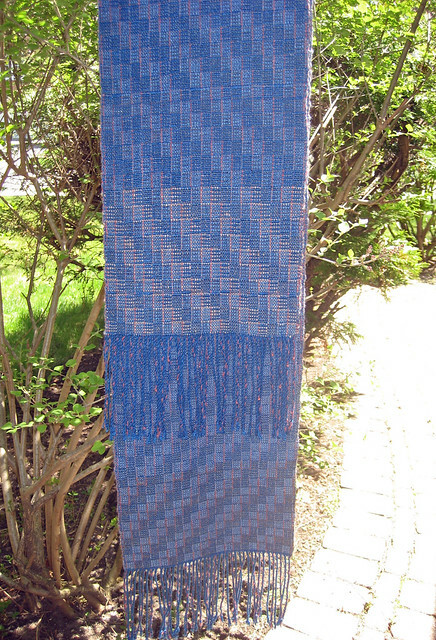 In my last post, I told you about the technical slip & fall of my first attempt in weaving for the Art Gallery of Burlington All Guilds Show. The show is on through May 24, 2015. It was a fully-formed piece, and I would like to share how the ideas developed. They are what really motivated me to tie-on for a renewed attempt. Some are clear rookie mistakes. 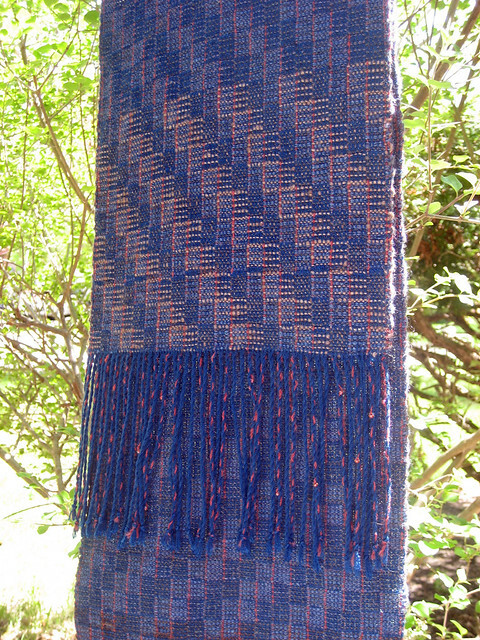 I will never forget how it felt to realize where my 3″ of width on the loom had disappeared. A bolt of understanding, and I checked the reed chart. Yes! Right sley (2-2-2-3); wrong reed! At 15 and not 12 to the inch, I was in maximum twill sett territory. With heavier wefts it makes for a slightly harsh fabric. The “soft sand” ground weft leaps forward against the other yarns that are darker in colour. It moves differently in the crackle structure, and the softly spun character also makes it stand out. It is 50% silk, and the remaining down fibres have a soft halo – 25% buffalo; 25% white cashmere. With one shore popping from the water, and the other subsumed, I wanted another shot at this representation. The dye step already gave me the matching sand. With a better understanding of my colours in the structure, I also set out to shift the grounds to blend the transition areas better. 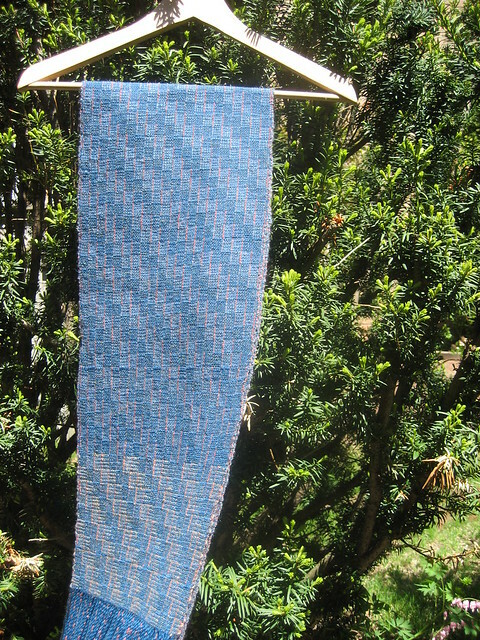 The up-sides were that my treadle, shuttle & new temple dance was also finally down pat after the 72″ of weaving! The “soft sand” yarn on the right was out, replaced by the skein yarn in front for the 2nd and last attempt. 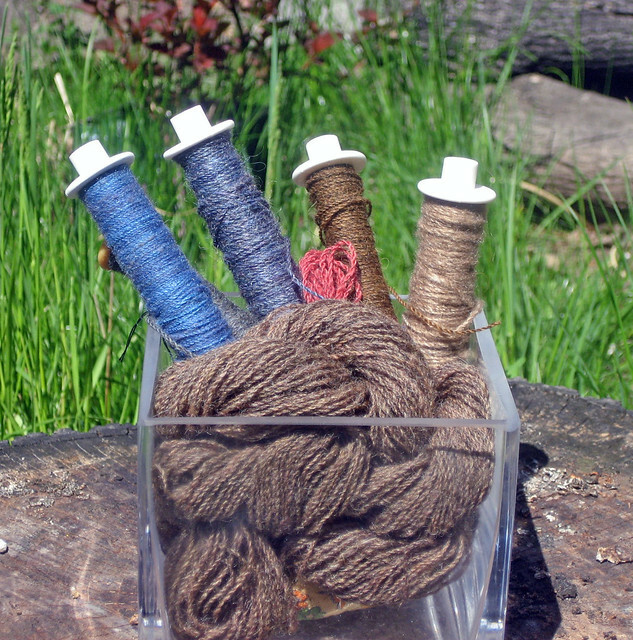 This now means that all handspun threads were made using spindles. Even with later challenges, I am happy that I persevered to modify for the design that I wanted. TKK apologies – published prematurely, and have reverted to draft status! 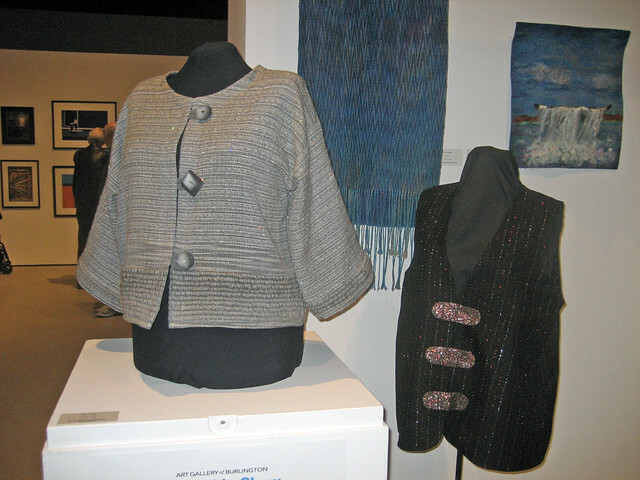 Sue’s beaded jacket, “Frozen Shores” is breath-taking. 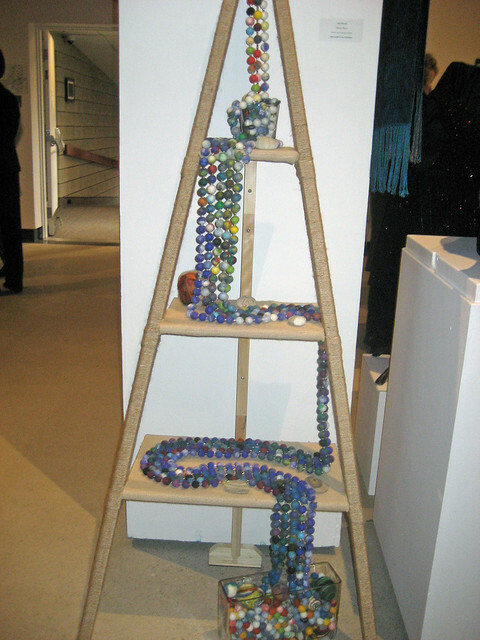 This was the first grouping that I saw at the show’s opening event, and I am still amazed by the beauty of her piece. Her two awards by the Juror were well-deserved! This ceiling-to-floor installation by Jennifer Earle won the Best in Show award. It represents the river’s flow from source to sea. 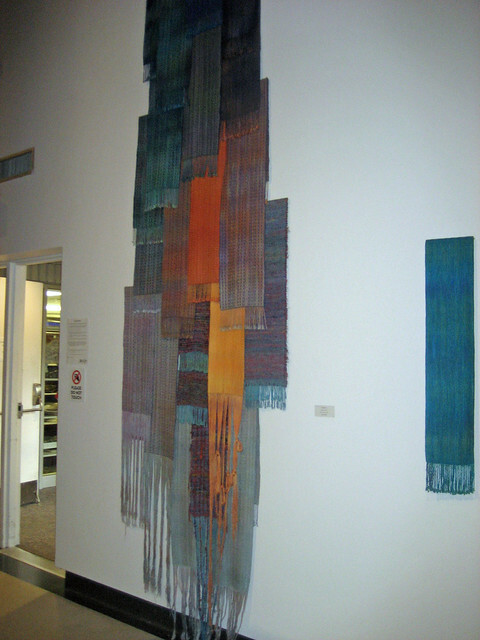 The installation of a new “Falling Water” is at the entrance to our guild’s section of the show. Jim’s placement of colour and sheer exuberance for his work made me smile on the spot. 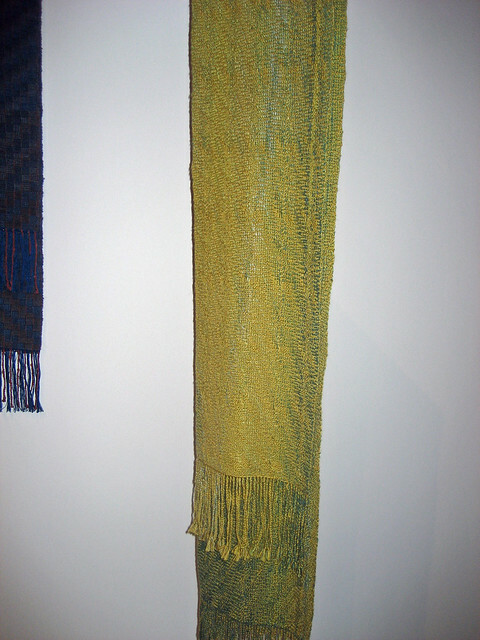 Representing the struggle for water sustainability, and her experiences in Africa, Marsha’s scarf has a beautiful mix of fibres, including linen. 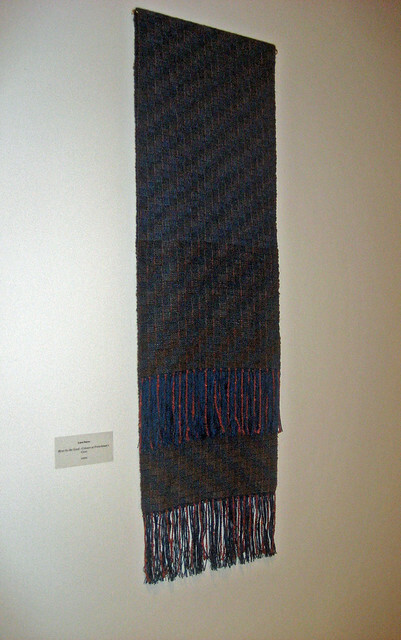 She’s my next-door neighbour on this gallery wall with handwoven scarves! That our space in the gallery includes diverse works ranging from functional objects, fibre art to those that use repetition of familiar forms all with reference to the colour of water is fitting with other guilds’ participation. Although I missed the meeting with its show tour, I’m sure that the feedback has been positive! The show runs until next Sunday the 24th. Local friends, I hope that some of you can get out to the AGB for a visit! 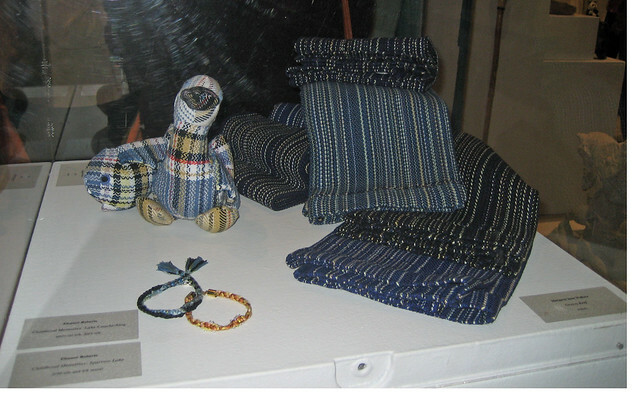 Categories: Finished & in the wide world, Getting the knack, Spinning Guild, Weaving | Tags: classic crackle weave, handspun yarn, handweaving, juried show, Scarf, sett, Spinning | Permalink.